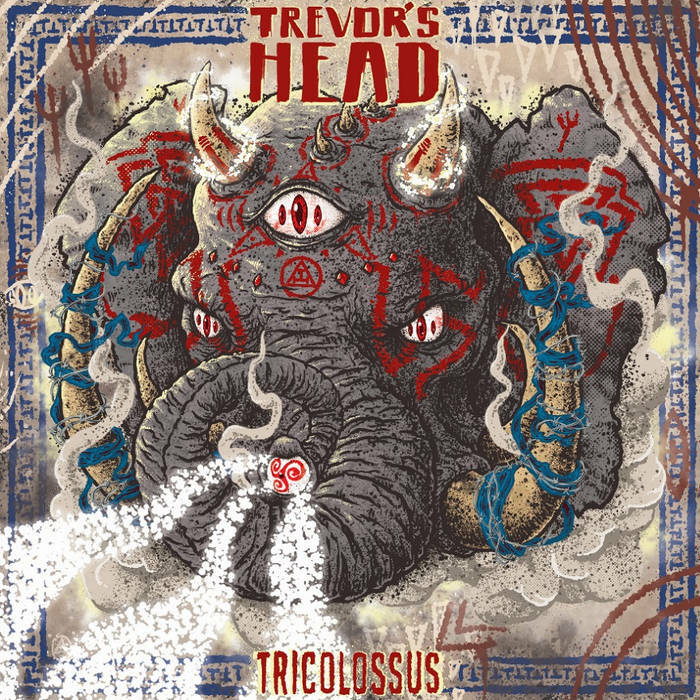 Trevor's Head is a punk outfit soaked and drenched in bong water, and hailing from Redhill, a borough of Surrey, England which was from the years 1881 to 1884 was the home to Aleister Crowley and his loving family. If you don't know him please Google him, read a book, draw a pentagram with goat's blood, bring up the devil, and ask "Hey there Satan, would you be so kind as to tell me about the third coolest British guy ever behind the Davids Bowie and Beckham?". But I digress. They're a trio consisting of (I'm choosing to believe the names provided on the band's Facebook page are the band member's real names and what their moms call them) Riffs McGregor on guitar, Clive Beats on drums, and DB Grooveson on bass. But the Bandcamp is probably more accurate. There, their names and positions are Roger Atkins on guitar and vocals; Matt Ainsworth on drums, flute, synthesizer and vocals; and Aaron Strachan on bass, acoustic guitar, organ and vocals. They've had a few releases since 2012, including a self-titled eight song collection, and a couple of singles, called Juice and Otherside. But this here is a review for their newest album, Tricolossus. Kicking off the album is "Blood Moon" with steady drums and confidently angry vocals, which turns into a bluesy jam with flutes and a stomp-inducing riff. "Government Whores" talks about my favorite subject in metal, collecting a black magical force. But the woven segments of each instrument take on a psychedelic edge that consistently collect and divide throughout. "Deep Blue Fish" and "Idiot Time" are mixed with various stories I was told while being tucked into bed when I was a child, bastardized together with powerful punk rock themes in a wonderful way until a more personal side is displayed for "Ordinary Kind" and "But a Scratch", where the fury of the singers is fully portrayed. And these ideas of anger, of fairy tales, and of relationships are all stuffed full of those riffs and beats and various singing styles that rip you in every direction imaginable. An album highlight is definitely closer "Casa De Eduardo", a track that's so fun and completely devoid of caring about conforming to a singular idea or song structure. And that's exactly what I've taken as the point of this album. They're a group of three experimental and talented friends who've completely found themselves and throw any form of normalcy and thrown it to the wayside. And the journey they've taken on the album in incredibly enjoyable.